We have such great new neighbors here in the desert. This is the place to be for Mars-related research. This month, there is a Martian-minded colony of international scientists, engineers and researchers working within 2 kilometers (1.2 miles) of our Mars 160 mission, based at the Mars Desert Research Station in the Utah desert. 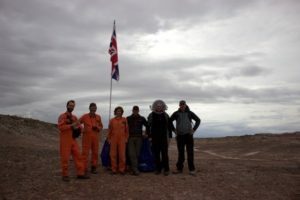 As we travel out to science field work in our spacesuits, we pass the camps of the Mars Utah Rover Field Investigation Team (MURFI) from the United Kingdom (UK); a contingent from the German Aerospace Center, known by its German acronym, DLR; and the tents of the Canadian Space Agency (CSA). All of these teams are out in the field testing rovers and using instruments that might travel to Mars. It's thrilling to have such amazing work happening near us. Like a bunch of microbes, together we are all searching for common survival strategies in this ancient Mars-like desert. In the past few days, under the guidance of our principal investigator, biologist Shannon Rupert, the Mars 160 crew ran a series of science-operation trials both in and out of simulation. On one of the few days out of spacesuits, some of our crew visited the MURFI camp. This gave me the opportunity to chat to Mission Commander Mike Curtis-Rouse about the goals of the rover field trials.